Sorry... the 2017 Toyota Prius c is no longer being sold as new. 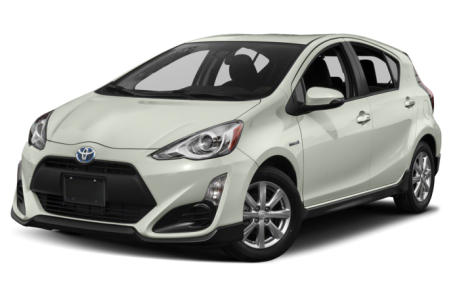 Instead, take the first step to a great deal on 2019 Toyota Prius c with a free price quote! The 2017 Toyota Prius c is a 5-door hybrid hatchback version of the Prius. It is the smallest vehicle in the Prius lineup. Its overall size and fuel efficiency make the subcompact very convenient for city-driving. Overall, the Prius c maintains a sporty hatchback appearance. The front-end features triangular headlights, a wide mouth grille, and tuner-esque faux air vents. This year, Toyota also added black-cladding along the underbody. Power side mirrors with turn-signal indicators and 15-inch alloy wheels come standard, while a power moonroof, heated side mirrors, and 16-inch wheels are also available. All of the Prius c trims are powered by a standard 73-hp, 1.5-liter 4-cylinder engine and an electric motor mated to a continuously variable automatic transmission and front-wheel drive. Fuel economy for the Prius c is an EPA-estimated 48/43 mpg city/highway. Inside, the Prius c features unique molded plastic textures along the dashboard and door panels. The center stack features a standard Entune audio system with a 3.5-inch display and Bluetooth connectivity for phone and audio. Standard features include automatic climate control, a tilt/telescoping steering wheel, a folding rear seat, and remote keyless entry. SofTex-trimmed seats, heated front seats, push-button start, cruise control, a split-folding rear seat, and a navigation system are also available. The Prius c earned 4 out of 5-star safety ratings in side-crash and rollover tests from the NHTSA. It comes standard with front air bags, antilock brakes, and an electronic stability system. Toyota’s Safety Sense C system is now standard for all Prius c models. It has lane departure warning, automatic high-beam headlights, and a pre-collision system.